Pale straw in color with hints of green and featuring blackcurrant and gooseberry on the nose with concentrated fruit and tropical fruit on the palate. Pairs well with crab, salmon, chicken, and cheeses. Recommendations: This time of year, I drink a lot of Sauvignon Blanc, which is why I’m always happy to get a sample sent my way. 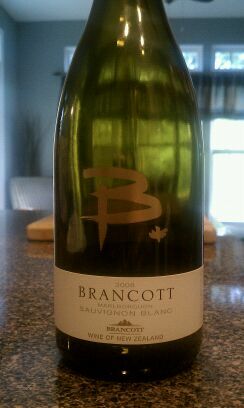 I’d never heard of Brancott Winery before I got this wine, but the description sounded good and like I said, I like Sauvignon Blanc this time of year. I didn’t really catch the hints of green in the glass, but the wine was certainly straw colored and given as how I’m not particularly familiar with gooseberry, I mostly got citrus on the nose. On the palate the wine was full of citrus with a finish of lemon-grass. Paired with a dinner of salmon and risotto, the Brancott B did a great job of cutting the richness of the risotto and the fattiness of the salmon. My only real complaint with this wine is the cost. While it’s certainly not a rip-off at $26, I feel as though I can get a quality Sauvignon Blanc for less. That being said, I would still recommend this wine, especially for a dinner of seafood. There are some brilliant New Zealand and Chilean 2008 sav blancs about at the moment. I dont know how familiar you are with these. But in the Uk, you can get a really good one for £5 to £7.